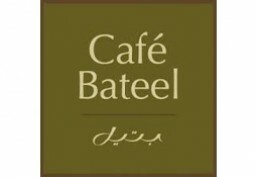 Cafe Bateel is currently closed for delivery and it will open at 08:00 AM today . Seasonal Special. A contemporary twist on a classic favourite, with green tomatoes, baby spinach, kale and asparagus served with two poached eggs and sprinkled with cracked pine nuts and pumpkin seeds. Seasonal Special. A blended mix of lentils, red quinoa, mixed grain with avocado, fresh Italian feta cheese and asparagus topped with a fried egg. A blend of muesli, plump dates, grated apple, plain low-fat yoghurt and mixed fresh berries. Homemade Umbrian foul beans served with cucumbers, fresh mint, spring onions, sliced tomatoes, lemon, Italian extra-virgin olive oil and Arabic bread. Baked waffle served with mixed berries, icing sugar, raspberry coulis, chocolate sauce and whipped cream. A selection of sliced fruits of the day. Traditional Italian omelette with diced tomatoes, Pecorino cheese, roasted bell peppers, sautéed potatoes, onions and button mushrooms. Whole wheat bread topped with avocado, jirjir and two poached eggs, served with garden salad in lemon dressing and beetroot hummus. Avocado toast, lightly grilled halloumi, sautéed potatoes, sausages, pine nuts and a poached egg, served with beetroot hummus. Omelette or scrambled eggs, a pastry of your choice, toast with a selection of Bateel premium jams, a hot beverage or fresh juice. Egg white omelette served with asparagus,smoked salmon and avocado, mini fruit platter, a hot beverage or detox juice. Homemade Umbrian foul served with cucumbers, tomatoes, fresh mint and spring onions, a hot muesli, a hot beverage or detox juice. Levant plate or shakshouka Bateel bread basket, a hot beverage or a fresh juice. Seasonal Special. A fresh avocado and zesty lemon base for our Italian halloumi dish garnished with zaatar, sumac and a touch of homemade beetroot hummus served on a light and crunchy Levain toast. Seasonal Special. A generous mix of mushrooms and grilled asparagus embrace our fresh burrata served with crunchy Levain toast and finished with a Bateel balsamic glaze. Slices of buffalo mozzarella and fresh tomatoes, layered on a bed of chargrilled vegetables, topped with rolled bresaola and finished with a basil pesto and balsamic glaze. Seasonal Special. A delicious toasted Levain toast with sliced avocado with your choice of toppings. Seasonal Special. Braised beef short ribs with onion confit lifted with fresh parsley and drizzled with a zesty lemon and tahina dressing on Levain toast. Seasonal Special. A delicate asparagus soup garnished with fresh parsley. Seasonal Special. Healthy and heartwarming cauliflower soup, lifted with fresh coriander and served with a delicate mix of grains and sesame seeds. A hearty soup of blended chickpeas, quinoa, onion and fresh tomato with a kale pesto bruschetta. Seasonal Special. A selection of perfectly seared tuna served with kale, edamame and cooked Hijiki enlightened with black sesame seeds and a wasabi dressing. Seasonal Special. A selected combination of healthy root vegetables served on a bed of Venere rice with a beetroot, artichoke and herb dressing. Mixed greens, avocado, cherry tomatoes, asparagus, Parmesan Reggiano cheese and Caesar dressing with Marinated Prawns. Wild rocket leaves with sautéed mushrooms, cherry tomatoes, pine nuts and Parmigiana Reggiano cheese, dressed with Bateel date Balsamico. Mixed greens, avocado, cherry tomatoes, asparagus, parmesan cheese and caesar dressing. Slow cooked quinoa, lentils, beetroot, butternut squash, served with baby spinach, pea shoot, kale, mixed seeds, chicken breast and avocado dressing. A healthy vegan bowl with quinoa, grains, spinach, kale, green peas, asparagus, avocado, broccoli, tomatoes, French beans, mixed seeds and moringa dressing. Seasonal Special. Fresh grilled salmon and cauliflower purée served with a homely leek confit and finely chopped chives. Seasonal Special. Succulent organic chicken tagine with Khidri dates, dried apricots, wild Rocca and green olives served on a bed of saffron rice. Seasonal Special. Braised beef short ribs, Greek mushrooms and roasted butternut squash served with seasonal root vegetables and sautéed kale. Grilled salmon on a light quinoa risotto featuring fresh coriander, asparagus, peas, zucchini and Iranian dry lemon zaatar sauce. Seasonal Special. Diced eggplant, Greek mushrooms, yellow raisins and chickpeas served in a perfectly spiced Madras style curry. Seasonal Special. Fresh tomatoes are the base for this Italian favourite served with buffalo mozzarella and pesto coulis. Farro grain risotto with green asparagus, baby spinach, zucchini, fava beans, tomatoes, with zaatar lemon sauce and grated pecorino cheese. Spiral shaped pasta with chicken, mushrooms, garlic and parsley in a labneh sauce. Tube shaped pasta in a light creamy sauce of mascarpone, reggiano parmesan and diced pecorino cheese. Marinated Tiger prawns with cherry tomato and crab bisque drizzled and garnished with lemon and basil. Seasonal Special. White chocolate and vanilla mascarpone on a biscuit base, topped with a lemon ganache and almond glaze. Seasonal Special. Light, moist pound cake and mascarpone, served with fresh berries and a crème Anglaise. Seasonal Special. White chocolate and orange mousse on a biscuit base, wrapped in an orange glaze. Moist freshly baked carrot cake with a sugar glaze. French classic pastry. Layered puff pastry with a smooth pastry cream flavoured with bateel date dhibs. Crispy sugar dough, baked with a mixture of prime pecans, sweet date dhibs and kholas dates topped with caramelised pecan nuts. Crispy sugar dough, baked with a mixture of finest pistachios, sweet date dhibs and Kholas dates. The quintessential American cheesecake with light cream cheese on a crispy digestive biscuit base, opped with strawberries. Chocolate biscuit with aromatic tonka bean cream, with dark chocolate madagascar origin mousse, crispy praline and feuillantine. Pleasingly rich and moist, made with our 75% Tanzanian-origin chocolate and crispy walnuts. Dark chocolate cremeux on a crunchy chocolate and caramel dough. A fragrant blend of black tea, apple, almond, cinnamon and vanilla served with fresh ginger, lemon and honey. Orange juice, pineapple juice, grenadine and lemon juice. Pineapple, fresh mint leaves and crushed ice. Mixed berries, cranberry, raspberry sorbet. Banana, yoghurt and fresh passion fruit pulp with seeds. unique blend of artisan vanilla ice cream, milk, organic rhutab dates and shot of espresso. Iced black tea flavoured with peach. Green tea, mint leaves and lemon juice. Iced black tea flavoured with lemon. A timeless classic. This fie wild Moroccan tea is a perfect blend of green tea with fresh mint leaves. Sprinkled with rosebuds and marigold flwers, Rooibos des Vahinés is a South African rooibos with the sweet notes of vanilla and almond. Perfect in the evening. Made with only the fiest handpicked Bateel dates and no added sugar. Made with only the fiest handpicked Bateel pomegranate and no added sugar. A unique blend of artisan vanilla ice cream, milk, Rhutab dates and shot of espresso. A superb tea from the best Gardens of Darjeeling-India, with sweet delicate floral note. A combination of Chinese green tea and rich fruit aromas including: roses, green dates, red fruit and orange flower water. Inspired by a Turkish recipe. A mild and fresh green tea, the best known and most loved in China. Cool and clear mint with an invigorating flavour that refreshes in summer and warms in winter. Thanks to its delicate Calabrian bergamot, Yunnan is one of the best black teas in the world. A particularly fine and well-balanced Earl Grey. Prepared with a high proportion of tips and most of the flowers removed, so that the jasmine bouquet is allowed to fully develop. Layered coffee with sweetened milk, Bateel date syrup and steamed milk. Seasonal Special. Bateel date syrup blended with sweetened milk, a shot of espresso and ice, topped with whipped cream. Traditional Arabic coffee alongside moist organic rhutab dates from our date farms. Egg whites omelet with sautéed mushrooms and Kale. Enjoy a hot beverage and a freshly baked pastry. Offer is available all-day. Enjoy a hot beverage and a cake or tart. Offer is available all-day. Tender chicken with chilli aioli, peppers, tomatoes, aubergine, olives, wild rocket & pecorino cheese wrapped in saj bread. Zaatar marinated chicken breast, sun dried tomatoes, jirjir lettuce and grilled eggplant with bateels date mayonnaise. Crispy ciabatta bread with tenderloin tagliata, romaine lettuce, sweet tomato relish and mustard mayo, served with a healthy kale and jirjir salad coated in walnut dressing.